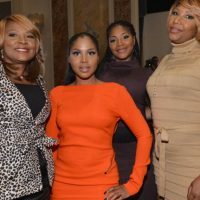 R&B singer Toni Braxton was honored along with past recipients at the Lupus LA 10th Anniversary Hollywood Bag Ladies Luncheon on Thursday at the Regent Beverly Wilshire Hotel in Beverly Hills, California. The singer, who was diagnosed with the disease and later revealed that she had it in 2010, was in the company of her family, mom Evelyn and sisters Traci and Trina Braxton. A past recipient of the organization’s “Woman of Achievement” Award, Toni Braxton was looking fashionable in a backless Tom Ford dress. Others in attendance at the sold out event which raises money for Lupas awareness and research included LisaRaye McCoy, Sharon Stone, Essence Atkins, Marla Gibbs, Jackée Harry amongst others.